You want to know how you can backup Android apps before a factory reset, you are going to unlock bootloader or install a new ROM. It is always suggested to have a backup of all your apps and app data. With Helium, it has been made easy to backup Android apps and data without root and you can keep the backup offline to PC, Mac or Linux system. The app is free and easy to use and you will able to backup everything including apk, apps cache, game saves etc. 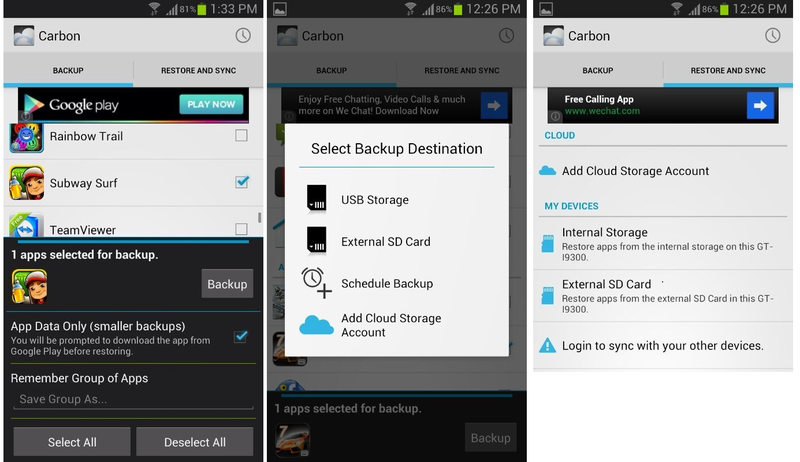 ClockWorkMod is a famous name to Android user and the man behind it – Koushik Dutta has introduced a new app Carbon Backup which will help you to backup your Android apps and cache data without root. The name of the app was changed to Helium to avoid copyright issues, but the app is still available on Play store and working fine for most Icecream sandwich, Jelly Bean, Kit Kat, Lollipop and Android Marshmallow users. Google introduced a Backup bridge in Android 4.0 ICS version. Helium uses this bridge to access app and cache data and back up it to PC or SD card. If you are rooted Helium works without connecting to PC application. If you have not rooted then you will need to install the desktop Helium application and connect the Phone to PC for error free operation. You just need to insure that you have an Android Phone running Android 4.0 or higher version. You will need to download Helium for PC [available for Mac, Windows, and Linux]. Also, install the Helium app on your android device [Premium version of Helium gives you advantages like to schedule backup and cloud backup]. Now, let’s go ahead with the detailed procedure of Backup without root. Step 1. Open the Desktop app installed on your PC or Mac. Connect your Device via a USB data cable to your computer. Step 2: Start the Helium app on your Device, You will be prompted with a box, just tap on “Ok” to go ahead. It will take a few seconds for Helium to verify the connection with the desktop application. Once done you are free to go ahead and backup apps and data. Step 3: Just Open Helium, Select the apps you want to backup, There will be an option to choose if you want to backup App data only. You can now select where to save the backup. Step 4: Helium will take care of the backup. You are done with the backup. To restore apps, open the Helium app and you will see tabs “Backup” and “Restore and Sync”. Select “Backup and Sync” and check mark the apps you want to backup. The app is easy to use, with the Premium version you will get features like Automatic Backup Schedules, One Android device to another sync, Cloud backup and restore using Dropbox, box.net, and Google drive. Helium works better than Titanium backup and thus most of the users have shifted to it. Let us know if you face any issue, we will surely try to help you. Also, subscribe to our social channels and newsletter to get latest updates.